Ghee, a form of clarified butter, is a well known cooking fat. 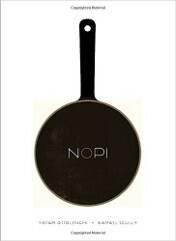 What is less known in the West is that it is also used for skin care and as medicine in Ayurveda. In fact, it’s basically a panacea in Ayurveda. I’m no expert in Ayurveda, but it is interesting to know that it has such a long track record in India as a topical treatment. What I have discovered so far is pretty neat. 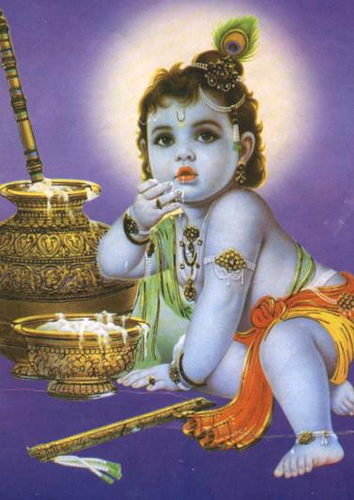 It is in the nature of ghee to sink into the skin rather than sit on the surface. This makes it a really excellent moisturizer. It is not the type of moisturizer which seals in moisture, or protects you from the elements, but it immediately soothes dry and chapped skin. For instance, during my last head cold, I used it on my much-abused nose. The ghee saved my nose and my lips from a terrible case of chapping. I always keep my lips and nose balmed-up during a cold, but the ghee worked better than anything else I’ve ever used, in terms of absorption, relieving discomfort and quick healing. Since then, I’ve been using it on my face and hands to fend off the dry, itchy skin of winter. Since it sinks in so fast, it helps to use it in conjunction with another moisturizer, one which stays on the surface of the skin, to seal everything in. Color me totally fascinated with ghee. There’s much research to be done on it here at Root Simple. Here’s an interesting fact: ghee doesn’t go bad. Ever. In Ayurveda, aged ghee is particularly treasured. See, butter becomes ghee when you remove the sugars and proteins and water, leaving only fat. Without that other stuff in it, the fat alone can’t go bad. 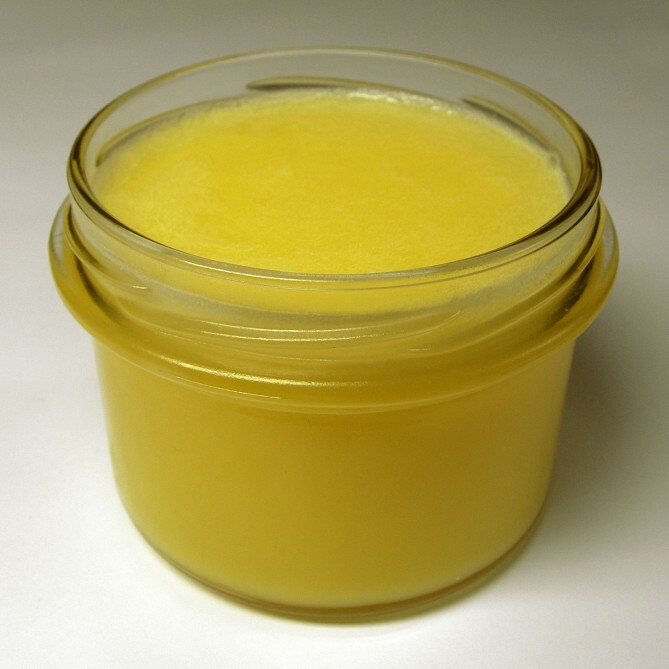 Ghee’s only enemy is water–which is true of all fat-based foods and cosmetics. Water sets up conditions for bacteria to breed. So keep your ghee dry. In fact, you should never store it in the refrigerator, because this may cause condensation inside the jar, which will lead to spoilage. Just keep it on the shelf, and scoop it out with a dry spoon, and it will keep until it’s all gone. That’s all I have to say on ghee, so far. I don’t know much yet, but I like the way it feels. More will follow, I am sure. I’m going to experiment with making body butter and lip balm with it. Do any of you use ghee for medicine or skin care? I went camping in Poison Oak Central last week, and though I tried to be careful, I got a kiss on the back of the hand from our rakish woodland friend, Toxicodendron diversilobum (Pacific or Western Poison Oak). It was, miraculously, the first time I’ve ever had poison oak. I don’t know how I’ve been so lucky so far. I’ve heard that rubbing native mugwort on the skin can prevent/treat the rash, and I’ve done that a few times when I suspect I’ve brushed against some poison oak. (Mugwort almost always grows where the poison oak does.) Whether all these emergency poultices prevented anything or not is impossible to prove, because I’ve never contracted a rash until this time. I’ll keep doing it, though. After avoiding the green bandit so long and so well, I was almost happy to get hit at last–in this mild way, mind you–because I was curious to see what the rash would look like and feel like. My exposure really was a kiss. It landed exactly where a gentleman would press his lips to a lady’s hand. Three watery blisters appeared on my knuckles after about 24 hours, accompanied by lots of general redness and itching. First I poulticed with both mugwort and plantain, but that only worked so-so. 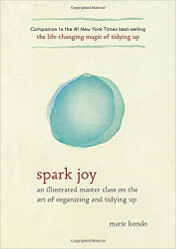 Then I hied off to the internet and sifted through the many folk cures until I found one I liked from good ol’ Dr. Weil. He recommended running hot water over the rash, as hot as you can stand it. I don’t remember that he said how long you should do this, but I decided to do it as long as I could stand it, which in my case was probably a minute or so. He said the heat will cause the itching to flare temporarily, but then suppress the itching for hours, and speed healing as well. Results? It worked like a charm for me. Of course, you want to be careful not to scald yourself and add insult to injury! But with that caveat aside, I definitely recommend giving it a try. I particularly liked that I could do the treatment before bed and fall asleep without itching, and be good until morning, when I’d do it again. All in all, once I discovered the hot water cure, I had bug bites which bothered me more, and lasted longer, than the poison oak rash. 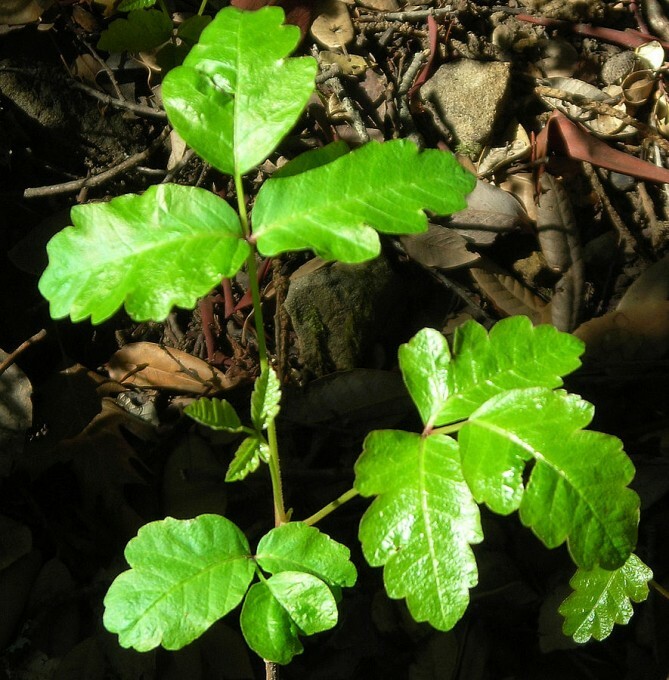 What do you do for poison oak/poison ivy? And to anyone who has been lucky enough to run into both plants, is there a difference between the two in terms of the rash? Is one worse than the other? I’m only familiar with poison oak. 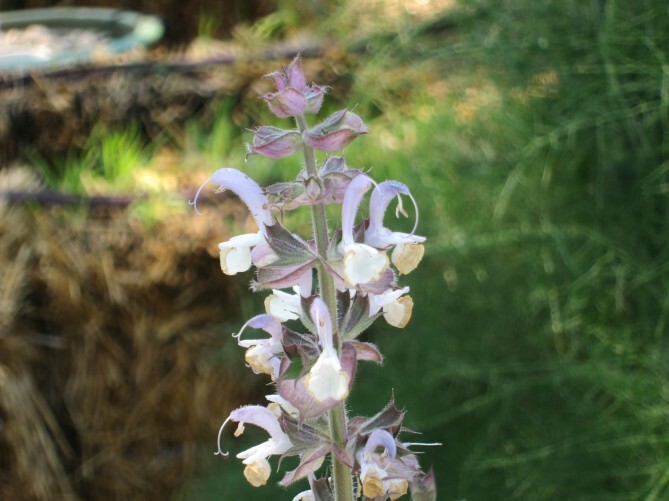 One of my favorite plants in the garden (I’ve posted about it before) is in bloom right now: the white sage, Salvia apiana. Salvia apiana means “bee sage” and boy howdy did they get that one right. 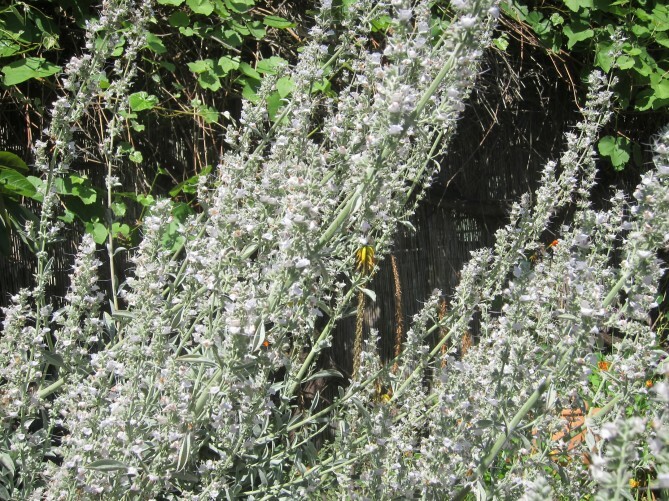 This sage puts up tall spikes covered with small white flowers that bees can’t resist. Unfortunately, our white sage is situated right by the garden path. So these days, every time I go into the garden I have to squeeze past the leaning spires, praying I won’t be stung, because the plant is thick with bees. Covered. It hums. Now, these workers are so busy that they don’t have time to be aggressive. For instance, they let me stand around taking blurry pictures of them working, until I got the one above. But stings happen by unfortunate mischance in crowded conditions. I suppose I could cut back the spikes, but whom am I to interrupt this passionate sage & bee love affair? Besides, it’s really pretty. The spikes are about six feet high, but delicate, like fairy lances. Here is a pic of the white sage as seen from our back door. I decided to leave in the wheelbarrow and some buckets of who knows what, and The Germinator ™ for scale. Right now this salvia is the star of the garden. All the sages are blooming now, actually. The ability to fill the yard with huge, wildly fragrant sages is, to my mind, one of the principle inducements toward living in Southern California. I enjoy the aromatics of our Mediterranean and native chaparral plants as much as the bees do. 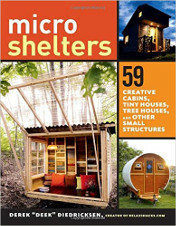 Here’s what we’ve got going right now–and I think I’m going to add more this fall. 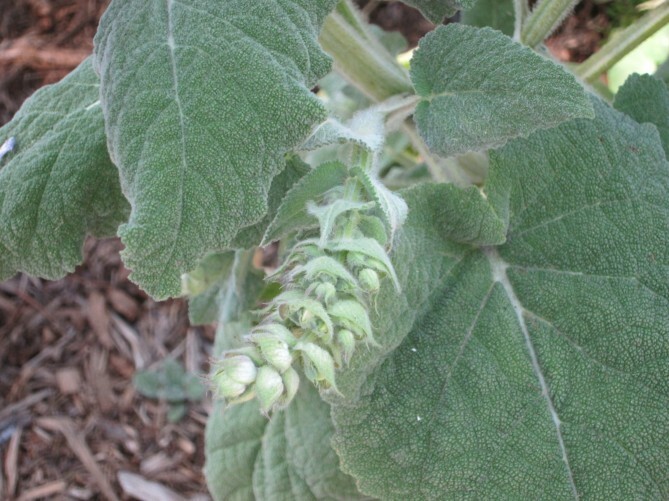 Below is our native black sage, Salvia mellifera, just coming into flower. 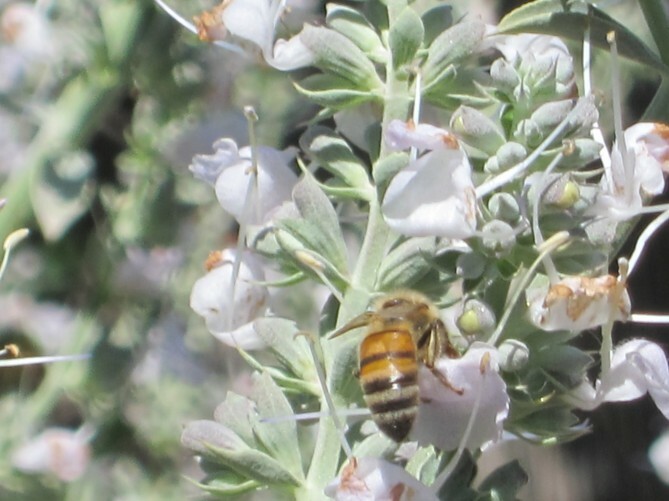 The bees like this sage, too. (They like all sages). This one arranges its flowers in little sipping cups for them. It has dark green leaves, which is less common than greyish foliage in the native sages. It brings reliable dark green foliage into the garden, and the foliage is powerfully fragrant. 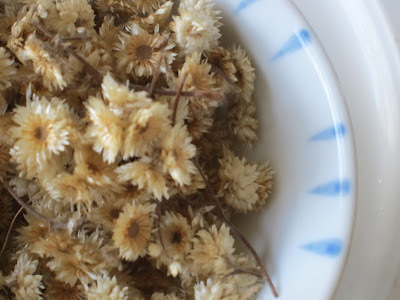 If you want to mellow out or soothe sore muscles, you could try throwing a a branch of this in the bath. 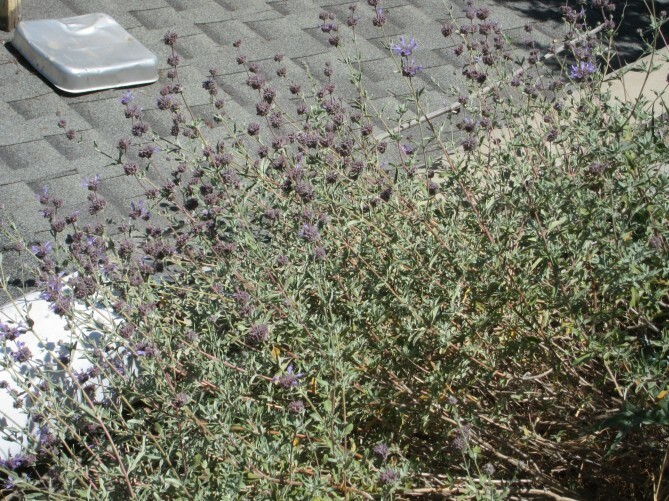 Our other native sage, Cleveland sage, Salvia clevelandi, lives a harsh existence out in the front of our house, occupying a formerly barren strip of sun baked clay above the black roof of our subterranean garage. The heat out there has moved its time clock along at a faster pace than the mellifera in the shady back yard. The blossoms are almost spent on the Cleveland. I’m not sure what else could live in that spot, except for prickly pear, so I’m very happy it’s been so sporting about growing there. And of course, bees like it. 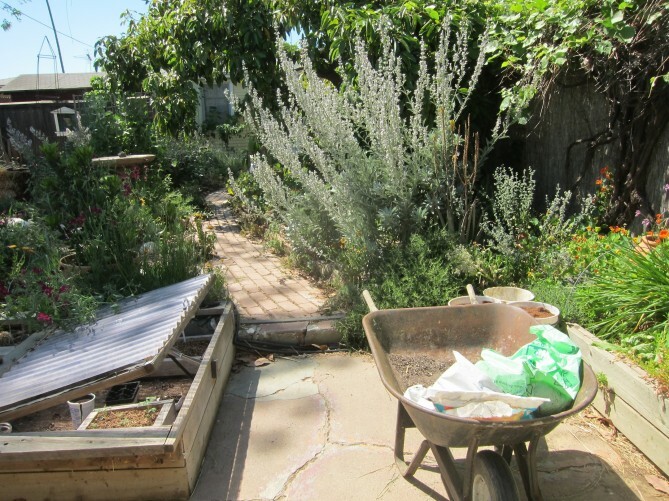 We also have an expanding patch of clary sage, Salvia sclarea in our back yard. 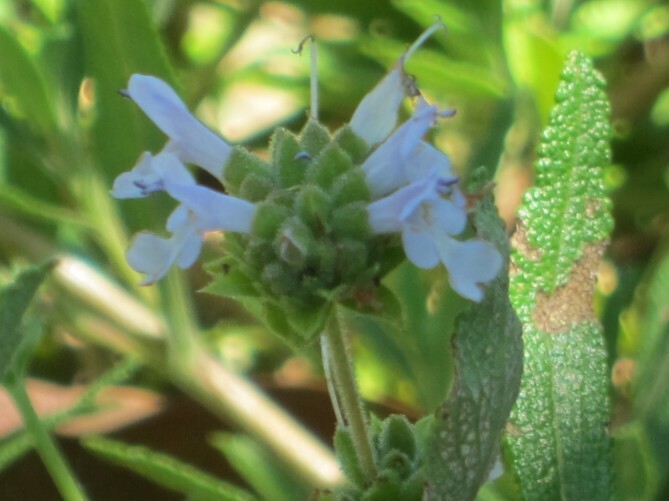 This sage is native to the Mediterranean. I planted this one on a whim, to fill a temporarily empty spot, but since then it has spread and really established itself as a player in the garden and now I find I’m just going to have to keep it and work around it. 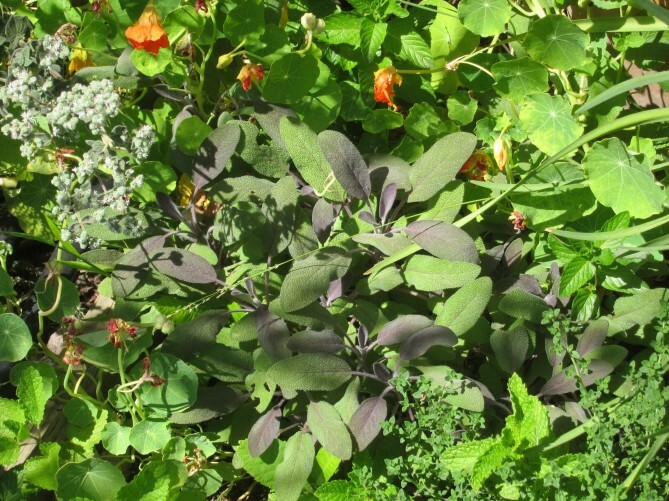 Most of the year clary sage is about knee high, with big, thick, fuzzy green leaves. But in the spring it sends up flower spikes to compete with the Salvia apiana. They are really gorgeous. The flowers are structured like the white sage flowers, but bigger. This particular shape seems to make bees giddy with happiness. 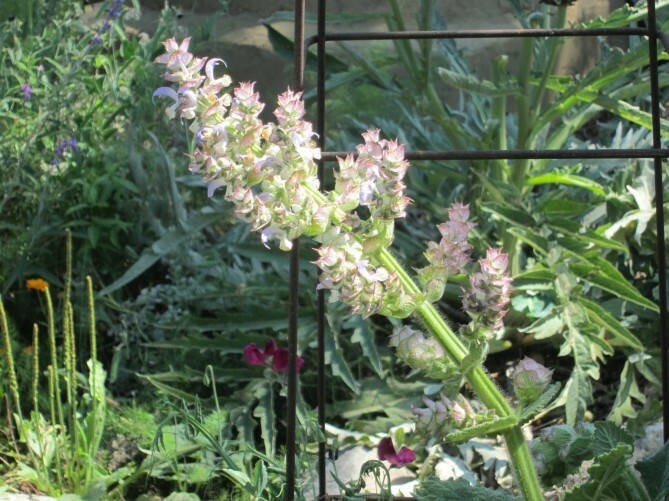 Clary sage has medicinal uses, but I’ve not tried it for anything myself. I’ve also heard you can make fritters of the leaves….which is interesting. Of course, I’d eat just about anything if it was made into a fritter. And last but not least is my culinary sage, tucked in with some thyme and mint, and beleaguered by the nasturtium. It’s not flashy, but its strong and knows what it’s about. It’s also indispensable in the bean pot. Do you have a favorite sage? Do you have any recommendations for my next round of planting? I’m thinking about adding at least two more to the grounds of our estate. Just a reminder to you all that Calendula officinalis (aka Pot Marigold) is super-easy to grow in the garden. Why should you grow Calendula? 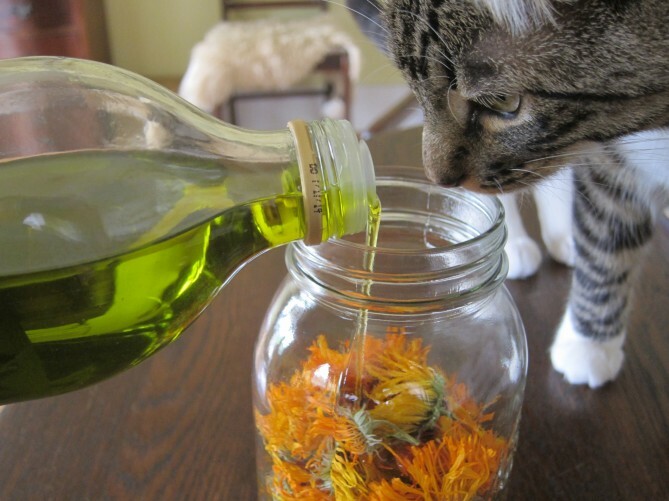 To make Calendula infused olive oil, of course– as I’m doing above, with inevitable feline assistance. Well, that’s why I grow it. Calendula infused olive oil is the base of all my lotions and potions, because it is such a potent healer of dry, itchy, burnt or otherwise irritated skin. I’m using it right now to treat my sunburn–which is what made me think of this post. It takes about 60 days for Calendula to reach maturity from seed, so if it’s spring where you live, now is a good time to plant it. Note that Calendula is a happy volunteer. Once you plant it, you may never have to plant it again. The volunteer flowers are not as big and fancy as their parent flowers–they revert to their wild form quickly–but they work just as well. Making Salves, Lip Balms & etc. Dried California Pearly Everlasting. The flowers are small, about the size of a buttons on a shirt collar. 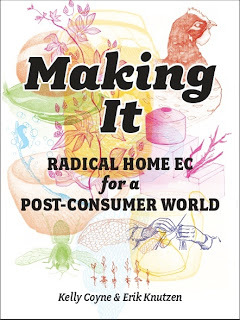 Last summer I was happy to be able to take a class on native plant use taught by Cecilia Garcia and James Adams, co-authors of Healing with Medicinal Plants of the West. One of the many things I learned in this class was that the flowers of California Pearly Everlasting, Gnaphalium californicum, aka cudweed aka rabbit tobacco, are supposed to be good for colds. I’ve not had a chance to try it until this week. I’ve only had one cold since last summer, and that one hit so fast and hard I just sort of gave up on doing anything but riding it out. The one I have this week is more of a typical head cold, and a good chance for a field test. And I can say that I think they helped. But I’m not sure how. My confusion is a result of memory vs. notes. I remember James saying he takes this tea instead of Day Quill whenever he has a cold. So, having the flowers on hand, I took the tea expecting it to act like cold medicine. Because the effects are so subtle (unlike cold capsules) I didn’t think my first cup was doing anything at all–until I realized I’d stopped sneezing and constantly blowing my nose. The relief lasted for a few hours. When I started feeling crappy again, I had another cup and the symptoms retreated again. Over the course the first day I had 3 cups. The next day, I felt much better. My symptoms were less, though I did still feel “under siege” and retreated to bed early. During the course of that day, I dug out my class notes and discovered that Cecilia said something different than what I remembered–she said that Everlasting is an immune stimulant, and when you have a cold you’re supposed to take one cup (one!) before bed for 4 nights. It has to be 4 cups over 4 nights, even if you feel better. No more, no less. So she’s using it more like Echinacea–not as a symptom relief. Meanwhile, random internet searches affirm that it’s good for colds, but don’t say how.